Many thanks to Recorded Books for sending a copy of A Harvest Of Thorns; a novel that will effortlessly raise your blood pressure and catapult you into social justice mode. This ripped-from-the-headlines story starts in a garment factory in Dhaka, Bangladesh. You know in your heart that nothing good can come from this setting. The story quickly introduces you to two young sisters who work tirelessly in this hellhole, and then just as quickly, it forces you to watch as they meet an unforgivable fate. The fire that starts in this factory is predictable and infuriating. The workers clamor to get out. There aren’t sufficient means to put the fire out. Supervisors order the workers back into the work rooms. The fire takes over, and workers begin to perish. The older sister makes a rope of pants and dangles it out of the factory window in an effort to save her younger sister. She ties a pair of the leggings around her sister’s face to quell the smoke. The end result of this heartbreaking scenario is that the older sister dies, and the younger sister falls to the ground. What’s captured on the nightly news is a photo of the fallen sister’s face, with the pants label visible from her make-shift mask. The photo goes viral. Cue the outrage. Cue the lawyers. Cue the international company that must now pretend that they had “no idea” that their pants were made in slave labor conditions. Cue the discussions about sweatshops and the rights of laborers. Cue the examination of the ethics of globalization. Hence, your elevated blood pressure. Where’s the justice? We then meet everyone from a journalist who has something to prove, to a corporate lawyer who is torn by his loyalties, to the head of an international company who just wants everything to go away. It’s all about stock prices, you see. We meet several people who have been taken advantage of within the confines of a multitude of sweatshops. We meet a teen who becomes pregnant because she’s sexually assaulted by her supervisor on a regular basis. We meet a young man who has his passport and papers stolen once he begins work, so he must remain a slave of the clothing industry for years. These people are heartbreaking, and so very real. You know without question that their stories are not fiction. You know this happens all the time. What this novel does successfully: it forces the reader to pay attention. Ask questions. Why is this pair of jeans so inexpensive? Who made these running shoes? Was this shirt made by a child? Surely these items were crafted in humane conditions? Surely these people were paid fair wages for all their toiling? Unlikely. You sense with certainty that the company in the novel, known as “Presto,” can easily be replaced by a myriad of company names that we hand our money to every day. You get a feeling of uneasiness when you see “made in China” or “made in Bangladesh” on the items in your closet. The gift of this novel is critical thinking. It’s the raised eyebrow when you hear another CEO stutter into a microphone that had they only known the conditions the products were made in… things would have been different. Because you’ll be in on the game. You’ll know that it’s nothing more than a push for numbers. Human beings don’t matter. Only the bottom line. And while the novel correctly demands that we ask corporations to have a social conscience, there was something about A Harvest Of Thorns that nagged at me. What troubled me about this novel was not the content. The story is brilliantly written by an author who is clearly a legal expert. I was not troubled by the characters, who were drawn with great depth and sincerity. What frustrated me with this story was its tendency to meander. It was burdened by endless descriptions, unnecessary side notes and stretching back stories. These things did not help to propel the plot, but instead stalled it with great frequency. I didn’t want details of boats and boardrooms, or about side affairs and equestrian lessons. Let’s not muddy the waters. Tell the tale. As the courtroom drama unfolded, I wanted a resolution. I wanted beautiful social justice to prevail. And while I absolutely understand the appeal of a story that’s a slow boil, the end did not bring about proper satisfaction for this reader. Instead, I felt exhausted. My opinion is that this book would have benefited greatly from some serious editing. Fewer side stories, more David vs. Goliath. The good news is that I’m in the minority here, as the overall reviews for A Harvest Of Thorns are stellar. There’s no question that this novel is worth your time. It’s content that would serve students well in any social justice course. The narrator of this story is Firdous Bamji, and he was truly fantastic. This was the first time I had heard Bamji’s work, and his ability to capture the emotion of every character, young or old, was almost unsettling. He brought a great deal of emotion to the story and I admired his work very much. I highly recommend anything he narrates. 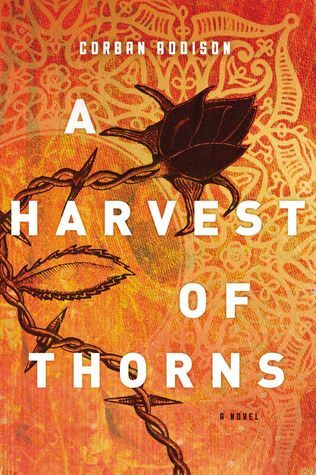 3.5 stars for A Harvest Of Thorns.